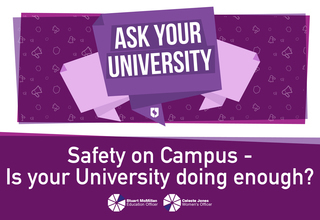 On the 15th May the final ‘Ask Your University’ event of the academic year was held, jointly held by the Students’ Union and the University on the topic of Campus Safety. The event allowed students to air their thoughts on how safety on campus is handled and voice questions and concerns about current procedures. The session was run by the current SU Women’s Officer Celeste Jones and SU Education Officer Stuart McMillian, and supported by other SU Officers, and was attended from various influential staff from both University and the Union including Brendan Stone, Vice-President for Education and Tracey Wray, Director of HR and Communications. The three topics of conversation were Inclusion, Racism and Sexual Assault. Discussion was facilitated by the Women’s Officer and the group discussed several issues relating to the topics. It began with a discussion about the purpose of the Rainbow Lanyard campaign, before moving on to the issue of staff training for handling LGBT+ issues. The group then split into two, with one discussing the current reporting procedure for sexual assault on campus while the other discussed the inclusion of Transgender people in the curriculum. At the end of the session the two groups were bought together, and action points were put forward from both students and staff. These included better communication about student union campaigns with the University, improved staff training for inclusivity and clearer reporting procedures. From the Students’ Union social media polls conducted in the duration of the event it was revealed that students rated their overall safety on campus 7/10. Only 43% felt like enough was done to ensure all students understood consent, 75% felt safer on campus with the presence of community police officers and 72% felt more was needed in promoting BAME voices within the University.